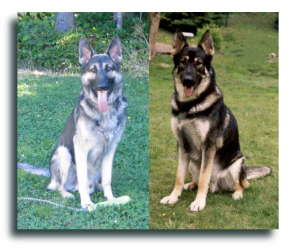 London and his progeny have made substantial contributions to the Shiloh Shepherd breed. 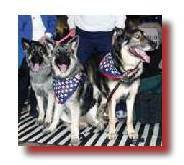 One of London's daughters, NS Ch Windsong's Dance of the Bitasweet, ROM ("Bita") is shown at right. Like her sire, she too is a gorgeous and huge champion. Another gorgeous London daughter is Windsong's Graceful Dancer, CGC ("Gracie"), pictured at left. London's brown sable coloring and smooth coat are not always passed on to his progeny, but his progeny are always beautiful! Yet another very special daughter of London's is Sylvie. In addition to being a beloved family member, Sylvie may be the longest-lived Shiloh ever. She recently crossed the Rainbow Bridge, just three months short of her 15th birthday. Three generations of London's family are shown at the right. London and three of his grandchildren are shown at the left. Please help us welcome the new generation of London's progeny born through the miracle of frozen sperm. At right is his first-born puppy sired by frozen sperm, Evergreens Chocolat Sucre of CJ. 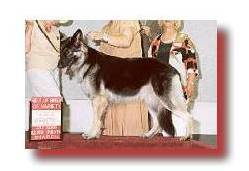 Her call name is "Chocolat" in tribute to the rare brown sable coloring and the coat she inherited from her sire. Chocolat was born on February 28, 2011. She has brought joy and hope by once again continuing London's line forward, but in a new day and age. Photo at right: Chocolat at 41 days. We predict she'll have great size . . . just like her dad! 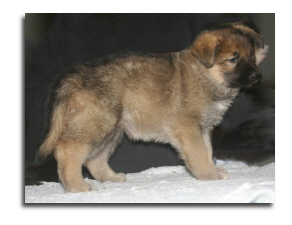 London's family and CJ's Shiloh Shepherds are thrilled to announce the birth of London's second litter on August 24, 2011 sired using his frozen sperm! Four males and five females will proudly carry London's line forward. London is an old-line second generation foundation Shiloh, so these pups offer a wonderful opportunity to renew the legacy of Shiloh Shepherds of the past. We're happy to report that the puppies are happy, healthy, and huge! Some have plush coats and some have smooth coats. Like their dad, those with smooth coats have longer, softer coats; not short and coarse. 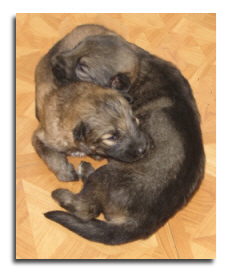 Photo at left: Two of the puppies at just under two weeks of age. London's progeny conceived from his frozen sperm are turning out to be "a chip off the old block"! The family relationship is strong. New! Appearance. At right is London's son, "Timber" (London's Olympic Heartwood of CJ) at one year. His human family is pleased with how strongly he resembles his dad! Intelligence and Heroism. In her book, the breed founder refers to London as "the brain." Although Timber's family is pleased that he looks like his sire, they're even more pleased that he's displaying wonderful characteristics of old-line Shilohs, such as an intuitive intelligence. 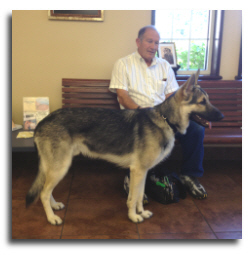 For example, at the age of 11 months Timber was a "hero"! Late one night he insistently led his owners to the back of their basement where their water heater was spraying hot water onto a nearby electrical panel. The electrical panel was soaked and the leak had created a 30 sq ft puddle of water. Thanks to Timber's innate intelligence and heroic actions, a potential danger and much damage was averted. Personality. London's pups are great ambassadors of the breed. Although natural home guards, they are wonderful with people too. Some Shilohs are aloof with strangers, but not these pups! People who meet them fall in love with their friendly and out-going nature. Their disposition is happy, sunny and playful. London's son, also called "London" (London Shoen-Hirn Von CJ) is owned by the original London's family. Recently young London was at a routine vet visit when another patron asked London's owners if he could photograph their gorgeous and friendly dog. (Young London in the vet's office is pictured at left.) His resemblance to his dad is clear. Even strangers recognize how special these Shilohs are! Beauty, Conformation and Movement. London's son, "Fog" (Smokey Valley's London Fog of CJ's) has already won major show titles before his first birthday! Everywhere he goes, he amazes and impresses those who see him. He brings the special strengths and qualities of the old-line Shilohs back to the show ring. Copyright 2002-2011 by Scrip family & GlobalSpan.net. All rights reserved.